How Can We Connect Teachers to Connected Learning? As a new doc student, you find yourself repeatedly answering the versions of the same two questions. Question 1: How long will it take to complete your program? Question 2: So what is your dissertation going to be about? At least that was my answer until I discovered Connected Learning. I came upon it through Henry Jenkins’s 2006 Confronting the Challenges of Participatory Culture: Media Education for the 21st Century The ideas in the paper greatly enhanced my interests in digital and media literacy. His paper prompted me to look into the MacArthur Foundation and later the Digital Media and Learning Hub where I stumbled upon the Connected Learning Report. I consider myself a bit of what Seymor Papert would call a yearner and the report immediately struck a chord. Content selected through student interests? Peer supported learning? Students creating products that demonstrating their understanding? Now we are getting somewhere! This was reimagining education using technology. I needed to learn more. Fortunately, the 2014 Digital Media and Learning Conference was in my own backyard up in Boston. The sessions were engaging and thought provoking, but most of all, the ideas seemed feasible in the K-12 classroom. However, I noticed that there were fewer K-12 educators there than I had expected and knew of few people talking about DML and Connected Learning in my area. I took it upon myself to start sharing the ideas out with whoever would listen. The first time was at a birthday gathering. A former teaching colleague asked the magic question about my dissertation. I was excited because she’s the type of teacher to try new things and thought she might be part of my future research on Connected Learning. Unfortunately, I made the error of describing Connected Learning in a general and abstract way. Silly academic mistake. As I explained the concept I watched, in horror, as the enthusiasm waned from her face and her eyes turned the size of quarters. She collected herself and said it sounded great, but the idea of facilitating 30 students and 30 different interests sounded daunting. The good news is that I didn’t scare her too badly. Since then she’s reached out to me to try a Connected Learning pilot project next fall. Still, my first attempt was a learning experience. I realized that if teachers were to get on board, I’d have to make it concrete. I had another attempt to share Connected Learning with Rhode Island teachers at the Highlander Institute’s Blended Learning Conference. I reached out to Christina Cantrill for permission to use an example from Teaching in the Connected Learning Classroom and she was kind enough to oblige. The first example was Larissa Pahomov’s 2Fer project where students wrote two-page position papers that were peer reviewed in Google Docs and then shared publicly on a website. I also showed a video from the Institute of Play showing students designing their own TED talks. This audience was far more receptive than my first and the iPad cameras came out when the Connected Learning Infographic slide popped up. However, the discussion segment of the presentation became bogged down when several teachers expressed frustration with the lack of technology in their schools. While I explained that Connected Learning was supported, not driven, by technology, some could not get past the notion that their lack of computers or wifi would limit the implementation of Connected Learning. A little less than a week from now, I’m going to get another chance to share the Connected Learning framework with teachers, this time at the University of Rhode Island Summer Institute in Digital Literacy. Institute participants not only attend presentations on DL hot topics and tools, but also use them to design a project to be implemented their classrooms or places of work during the fall. 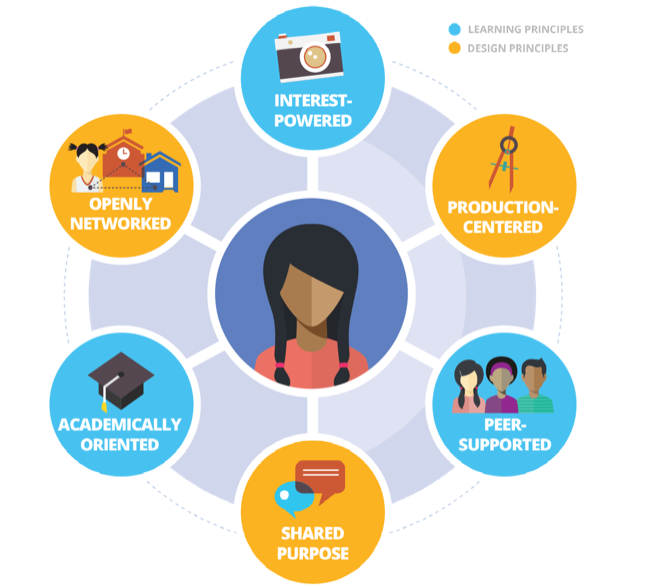 I’ve learned from my previous experiences to make the Connected Learning framework as concrete ad possible and, as John Seely Brown advises, focus on the learning around the tech, rather than the tech itself. One goal of the presentation is to do some recruiting for the CLMOOC community, which has shown me different ways to put ideas of Connected Learning into practice. Kevin Hodgson gave me the great suggestion of having participants engage Make Concept, such as creating a Wiki Stix avatars of themselves. However, it’s a challenge to truly help someone understand Connected Learning in a mere 30 minutes. While I’ve already designed my talk for Tuesday, I’m one to tinker. My hope is that this blog post is the beginning of a conversation between connected teachers and learners. When you talk to fellow teachers about connected learning, what do you share with your colleagues? How can we get our peers to re-think about how we design learning experiences?